Asus has launched today new ZenBook Series: ZenBook Pro 15 (UX580), ZenBook S (UX391), and ZenBook 13 (UX331). These laptops are state of the art and come with innovative and powerful features. This laptop comes with the futuristic ScreenPad that combines high-resolution, full-color auxiliary touchscreen with a touchpad. This is the next-level intelligence in working with Windows & ScreenPad Apps, thus enhancing workflow and productivity with adaptive functions and context-sensitive tool. This laptop is powered by up to 8th Gen Intel Core i9 processors, 16GB RAM, GeForce GTX 1050 Ti and 1TB PCIe x4 SSD. It offers connectivity options of 802.11ac gigabit-class Wi-Fi, USB 3.1 Gen 2 Type-C with Thunderbolt 3, USB Type-A and standard HDMI ports. This laptop comes with 15.6 UHD, NanoEdge 4K Touch display. This laptop has slim and elegant all-aluminum unibody design with iconic spun-metal finish in luxurious Deep Dive Blue with Rose Gold detailing. This laptop has 13.3 inch display and has 1kg near-A4-size metal unibody with MIL-STD-810G military-grade toughness. It comes in new Deep Dive Blue or Burgundy Red colors, with Rose Gold diamond-cut details and iconic spun-metal finish. It has new ErgoLift hinge design with 5.5° keyboard tilt for ultimate typing comfort, improved cooling airflow and enhanced audio. 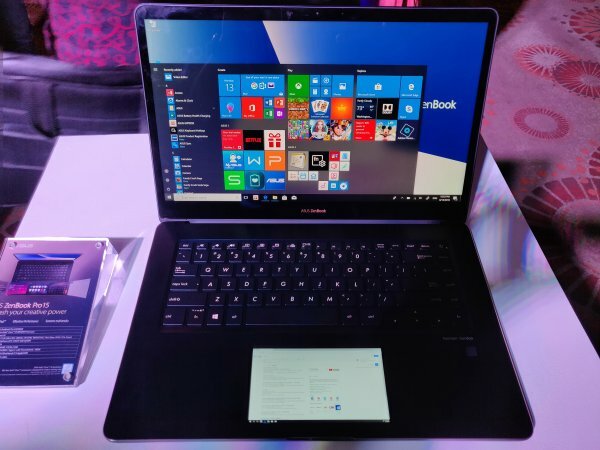 It comes with Full HD NanoEdge display, 8th Gen Intel Core CPUs, 512GB PCIe SSD, up to 13.5hrs battery life, Thunderbolt 3 connectivity supported by USB Type C.
This laptop is only 13.9mm thin, weighing only 985gm, with a beautiful crystal-like finish with MIL-STD-810G military-grade toughness. It is powered by up to 8th Gen Intel Core i7 CPU with 512GB SSD and 16GB RAM. It has slim-bezel NanoEdge Full HD wide-view with wide 100% RGB color gamut and is packed with Harman Kardon audio. It also boasts of full-size backlit ergonomic keyboard, fingerprint sensor, USB-C, USB Type-A, HDMI, microSD card slot and 802.11ac Wi-Fi Master connectivity. It is packed with specially designed 50Wh lithium-polymer battery which keep the machine alive fo 13 to 14 hours.